I wanted to do something different with a build up of the classic Red Baron, but without being so "Red Baron-ish", yet using as much of the kit as possible... A tough sell by all means. Then one day I fell across an old Rowan and Martin's Laff-In poster of Arte Johnson as the German solider... "That's verrry intrastink, but stupit" Suddenly an idea struck, it would require some further thought, but a World War II cab over style truck with round wind screens took solid root. I now had a very interesting and fun germ (Full pun intended) of an idea, but what sort of truck should it be? I decided to go ahead and start the project and see where it would lead me. I first carefully cut the Red Baron body only off the frame and moved it to the front of the chassis, glued it in place. I ditched the straight six Faulker engine in favor of a Pie Wagon flathead V8 linked directly to the RB quick change. The Pie Wagon headers were flipped over and cut down with the RB machine guns being converted into shielded mufflers, the finial tips are Beer Wagon stacks, drilled out. Added red plug wires and a simple custom air cleaner for the tri power. Engine done. I cut about a quarter inch off the front cowl so it had a much lower nose, then scratch built a slatted grill and mounted the RB fuel tank in front of it all. The windscreens were made from parts box flat clear cut to shape by clamping two dimes, one on each side, and grinding away the not round parts. The side tanks are Beer Wagon tanks and the flatbed was made from leftover Undersea Pickup bed panels. Pluged the hold in the helmet and stripped it. Body done. Now it came down to just what would ride back there... I thought about a cannon, but it's clearly not battlefield ready. I thought about a fuel tanker, but there are plenty of that sort of thing already too. 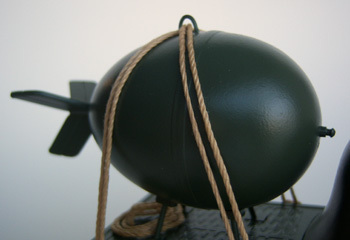 I then thought about a really big stupid looking bomb and the "Uber KerBoomer" was born! The Uber Kerboomer itself was made from, if not too obvious, an Easter Egg with parts box tri fins and a detonator made from Evergreen stock. Everything was painted Krylon satin olive, with the seats being a little darker cap mixed drab, white faced gauges. The rope is made from finer crochet thread soaked in coffee to get a more rope like color, then dipped in "Elmer's Glue Water", (a very very thin mix of water and Elmer's Glue. Duh.) This took care of the all the little out of scale looking fuzzies the string had and made "setting" it in place a snap. Put it in place and add a tiny drop of water, wait a moment and it stays in place. The rope coil was made from leftover "rope" curled up while wet. Not much else to tell that you can't see. About two weeks start to finish, made possible by the satin rattle can uni-color mostly. All in fun!